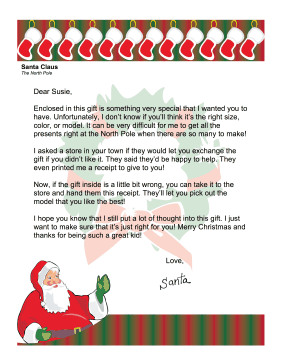 If Santa is worried that a recipient won't like a gift, he can include this explanation letter along with a return receipt. Enclosed in this gift is something very special that I wanted you to have. Unfortunately, I don't know if you'll think it's the right size, color, or model. It can be very difficult for me to get all the presents right at the North Pole when there are so many to make! I asked a store in your town if they would let you exchange the gift if you didn't like it. They said they'd be happy to help. They even printed me a receipt to give to you! Now, if the gift inside is a little bit wrong, you can take it to the store and hand them this receipt. They'll let you pick out the model that you like the best! I hope you know that I still put a lot of thought into this gift. I just want to make sure that it's just right for you! Merry Christmas and thanks for being such a great kid!